Donald Trump was not my first choice you prison United States I Wallace. I didn't win. 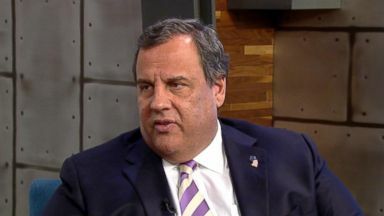 The brash former governor of New Jersey doesn't pull any punches that's simply not Chris Christie's style. Donald Trump still leadership all you've yet to some extent sure but did in the much different much more important way bill. Law. Bill involved Christie's new book out tomorrow let me finish trump. Commissioners and in New Jersey and the power in your face politics could cinema company. And we set to 21 on Friday younger priest for embargo in this book as you know. And I anyone can get that White House because if you're for gun into that building the chance of leaking was probably pretty good. The federal government is just barely back up and running again after the longest shutdown on record the state of the union postponed for a week. Because politically at least the nation's capital. There's been a months long state of destruction. Here's the art of the deal guys. And it can't get a deal on the border world yeah well listen sometimes politics is different in real estate. I said that so many number tarps Christie says there's no question the Democrats won this round. How prepared is the principal us I think you see that his give her nickname river he calls Chuck Schumer crying chalk. He is known nickname for Nancy Pelosi city I can't ethicist who how important this. Tomorrow the big event in Washington. And arraignment today one of the president's longest political advice. Roger Stone the latest casualty of the moment. I look forward today. Indicated after certain things in that in that indictment that should be concerning for people. At the top levels of the truck campaign in the summer of 2016. Because they're the referenced over and over again. In the indictment as having directed stone to do certain things and yet you write in the book that you feel like this was a team that was too disorganized. To collude with the I do I still figures Beers evidence of collusion. With the Russians you'd ever know people at the top levels of the truck campaign. Should at least be concerned about what else. Mr. Miller me now and how concerned should the president and now. Listen it's never good. To be you know an executive where there's any investigations going on because is distracting. From your ability to do the job and your heart to do. Governor Christie knows that firsthand. Bridge gate overshadowed his second term is New Jersey governor the scandal over the partial closure of the George Washington Bridge. Allegedly to punish a New Jersey mayor who refused to endorse the governor's reelection to bridge did. Muster the president's yeah I think it did. I too. Because I think that what happened was. I had that come with the front runner for the Republican nomination. I just 161% of the vote for re election to blue state and I think comes a threat to people. 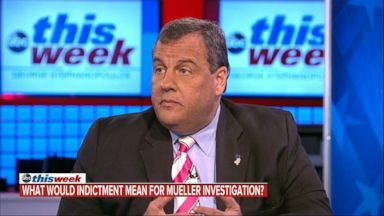 Christie's political standing was badly damaged by a bridge cute you little prosecutors were unable to come up with any proof he was behind it -- happened. Not one shred of evidence out there that I ever had any involvement in this at all. At least partly because the fallout from bridge game. Christie's presidential campaign never really got off the ground I'm happy to be on the truck team and I look forward to working with them instead. He was one of the first major Republicans. To endorse trump next president of the United States Donaldson. Assumed he regretted it based on the look on his face at this event lives. People said it looked like a hostage but what were you thinking about when you're standing so uncomfortably on that boat I wanna be there might jobless that you do some good off the stage. He sits we stay here stay here I wasn't thinking anything other than. And who don't want to be standing up here because it's his night it's not mind the book recounts all the big campaign milestones. Including below point Reyes grabbed by the the release of the Access Hollywood today in a here reverent but when he sought. He threw relative to use its main locker room talk locker room banter. Auckland after reports that a ones and the hook Christie also settle some scores with other key players on the campaign. Michelson. You're not a big fan know he's he's a criminal. And he's train wreck I begged the president. And not give him that shot Steve Bannon he's the only I have ever met who can look of pretentious a look at unmade bed at the same time. On I think that's just the password start Steve but the truck advisor comes in for the most sustained criticism in the book. He's still the president's side son in law Jared Kushner as nepotism a problem for the express why they'll what's just think it's hard to have. It's hard to be objective structural family. First off you love them. Sort reject about them and if they do something really wrong. It's hard to fire. He's got a Thanksgiving with. There is a narrative. Out there that Jared Kushner and evoke a trump. Soften some of the darker impulses and channel president trump to a good place. I think there are times when Jarden bock a play a constructive role. With the president amended order consummate don't. Christie recounts of bitter meeting and drum tower in which he says crushed or took him to task for prosecuting his father billionaire Charles Kushner pleaded guilty to eighteen counts of financial crimes and witness retaliation. Who was sentenced to two years in prison. When Kristi was the US attorney for managers. I was overzealous he said that. All I. That this was a family dispute that should be left to the family and rabbis to resolve. Not federal prosecutors. Christie says trump overruled pushed invented trump tower. But hints that the solo work behind machines. First to keep Christie off the ticket. And later to push him out altogether firing him from leaving the transition team. Yes Steve was the executioner that was sent to do the job he Farley said listen it's it was Jared the free Steve used was. He's been taking an ax to your head with the boss. Ever since I got here Christie says that was two days after. That historic election upset a victory night that included this scene captured on camera at commissioner's request. Jared came up to my son answer and said would you take a picture of your dad night together at this moment. Because noble ever believe that your father and I came together to help elect the president the United States you do Liddy you're out in. It's our politics is a tough game I have pretty broad shoulders and pretty thick skin. And you know put yeah that was tough. We reached out to ban in Kushner Flynn and the White House no comment so far Christie says the only post he would've wanted in the trump White House. Where vice president or attorney general if you had gotten the attorney general to. Were there even be a lower investigation probably not now. I don't think so because I would have accused myself would you investing isn't sure. You have to a mean there's clear evidence that Russians. In attempted to interfere with our election 2016. That's one of the greatest threats toward democracy so you bet you have to investigate absolutely. And you follow the facts were really need now Mike the rest of us Chris Christie is watching with interest. In fact he's an ABC news contributor do you still harbor. Presidential ambitions and would not really sore and humans yeah I think you don't eat into your best shot I would only run for thought but I have a legitimate chance to win. I'm I don't like engaging in this kind substances and exercise but absent those factors lining up. I'm also pretty happy with my life is that as it exists now. 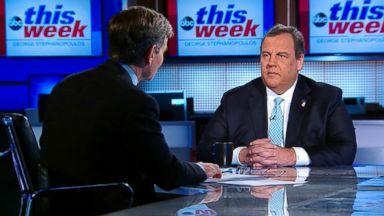 ABC News' Devin Dwyer talks with Christie about the new book, nearly being named vice president and life after politics. 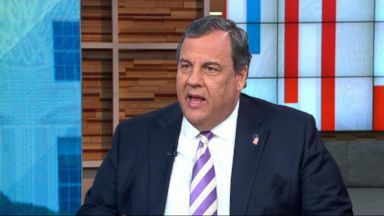 The former New Jersey governor speaks about the details in his new book, "Let Me Finish," and weighs in on the political news of the day.